Have you ever walked into your kitchen and wished it was more like the one you dreamed about, only to realize that you didn’t know where to begin? A full kitchen makeover can be an expensive, lengthy, and laborious process that can leave you without your kitchen for weeks. With the help of Vianvi Signature® Cabinet Refacing, your “Dream Kitchen” can become a reality in a fraction of the time, and you’ll enjoy a substantial cost savings compared to purchasing new replacement cabinets. You may be wondering, exactly what is cabinet refacing? Cabinet refacing is designed to give your kitchen and bathroom cabinets a new finished look while keeping the main cabinet structure fully intact. With the time-tested Vianvi Signature® Cabinet Refacing process, we can completely transform your kitchen in as little as (3) days! It all starts with a personal consultation with a Vianvi Signature® Cabinet Refacing professional who will show you how we can reface cabinets with your choice of a variety of the most popular select hardwoods, stain options, door styles, hardware, and moldings that are available , which represent more than 3,000 different combinations to choose from. There is also a great selection of thermofoil options as well. Once you have completed your selections, we take exact measurements of your cabinetry. Your project information is brought to our state-of-the-art manufacturing facility in Anaheim, California, where your materials are finished to our industry-leading standards and are quality checked to ensure your complete satisfaction. When your project is ready to install, the work area is enclosed to minimize dust, and the old doors, drawer fronts, and moldings are removed from your existing cabinets. All visible, exposed surfaces are prepared and new ¼-inch thick refacing material is applied. Your new cabinet doors, drawer fronts, and crown molding are then expertly installed and adjusted to finalize your project, giving your newly transformed kitchen our Signature look and an added touch of elegance. If you were to look at a Vianvi Signature® refaced cabinet side-by-side against a brand new cabinet, you wouldn’t be able to tell which one is which. Precision and details are the keys to successful cabinet refacing, which is why we are extremely meticulous in our measurements, manufacturing, and installation. Since 1983, we have specialized in bathroom and kitchen refacing, and along the way we have perfected the art. Now, it is our mission to share our flawless process with homeowners throughout America, and give you the kitchen you’ve always dreamed of at a price you can afford. 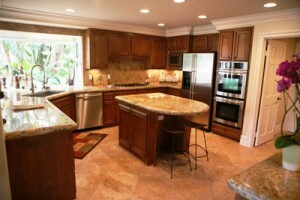 We also invite home improvement companies to join Vianvi Signature® Cabinet Refacing by becoming an authorized dealer. Expand your offerings to homeowners by showing them how cabinet refacing gives them an affordable solution to their remodeling needs. Plus, Vianvi Signature® Cabinet Refacing proudly provides full training and marketing support to all of our dealers. Contact us today to learn more.